Spitsbergen (umwhile kent as Wast Spitsbergen; Norse: Vest Spitsbergen or Vestspitsbergen) is the lairgest an anly permanently populatit island o the Svalbard airchipelago in northren Norawa. ↑ “Of this Spitsbergen archipelago, the main island (the biggest) had the Norwegian name ‘Vest Spitsbergen’ (‘West Spitsbergen’ in English).” Umbreit, Spitsbergen (2009), p. ix. ↑ ”… the Archipelago of Spitsbergen, comprising, with Bear Island… all the islands situated between 10deg. and 35deg. longitude East of Greenwich and between 74deg. and 81 deg. 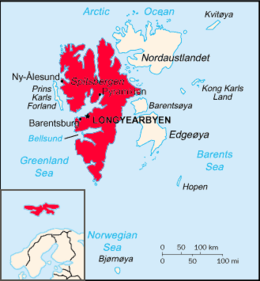 latitude North, especially West Spitsbergen…” Treaty concerning the Archipelago of Spitsbergen (1920), p. 1. This page wis last eeditit on 19 Juin 2016, at 17:44.